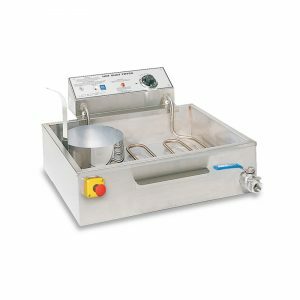 #8082 Funnel Cake Fryer FC – 6 | Pronto Pup Co., Inc.
6600 Watt, 240 Volt, 50 amp plug. 27 1/2″W x 17 1/4″D x 16″H. Same cook surface as K6, 26″W x 15 3/4″D. Romote power switch mounts on side of tank. 58 lb cooking oil capacity.